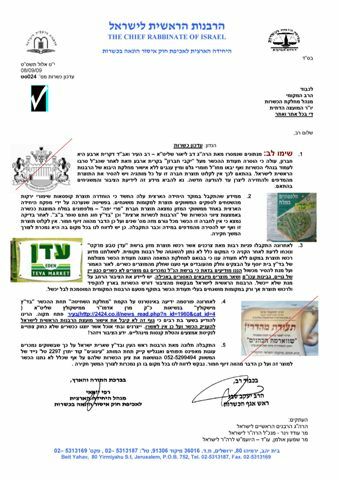 As was reported earlier by JKN, Rabbi Dov Lior Shlita has revoked the kashrut of the Chief Rabbinate from the winery, reporting unauthorized ingredients were used. The product is labeled under the supervision of the Chief Rabbinate National Supervision and Chug Chatam Sofer Bnei Brak when in actuality; it has no kosher supervision whatsoever. Health officials fear the product’s origin is in PA autonomous areas and the quality may be substandard as well. (See item 2 in the original Hebrew document below, photo on the right side). Another unauthorized certification has emerged, known as Badatz Mishkolitz. The certificate claims to give supervision over the slaughter of meat under the watchful eye of the Rebbe of Mishkolitz. The public is warned that this is an unauthorized certificate. (See item 4 in Hebrew document, photo right side). The Rosh HaAyin Local Rabbinical Council and the Badatz Sheirit Yisrael have both receive complaints that cakes (English cake and apple muffins) are being sold under the label of Ingunim Cakes, claiming kashrut supervision from both agencies while in actuality, it does not certification from either. This document presents the actual facts from the Hebrew original but is not a literal translation. Posted on September 9, 2009 by JKN Israel. This entry was posted in 5769 - 2008/2009, Chief Rabbinate Updates. Bookmark the permalink. which hebron winery? is that hevron-heights winery? please specify. also, must one discard bottles of wine already purchased, or is the problem only for this coming year’s wines? Please check the website. I reported on the matter last week, including Hebron Wines as well as a clarification concerning Mt. Hevron Wines to avoid confusion.